Modern airports look like shopping malls with sleek stores, glass elevators, plasma screens, occasional sculptures, and everywhere people milling about, some bored, others excited, some lounging, others bouncing on their toes. They’ve become places where many millions of people from all over the world pass through to new destinations, a kind of “no-man’s land.” For instance, in 2015 alone, over a 100 million passengers went through Atlanta’s Hartsfield Jackson International Airport. This is a story about three transients in another airport finding commonality in their spiritual practices. Many of us in yoga circles talk about taking yoga off the mat, yet some pretty cool experiences happen on the mat, and in airports. While I was working for the World Bank, I was on a flight home from Burkina Faso to Washington, DC. The overnight flight stopped in Paris, at Charles de Gaulle Airport. Our flight arrived pre-dawn and the next one was to take off that afternoon. With time on my hands, I slouched down an empty airport concourse to the end gate. Nobody was there at what my jet-lagged body considered an ungodly hour. I sat down with my belongings, took off my shoes, rolled out my yoga mat, and proceeded to do Ashtanga Vinyasa Yoga, which always has a restorative effect. Minutes later, a man came down the concourse, sat down next to my carry-ons, removed his shoes, rolled out a prayer rug, and proceeded to say his morning prayer, Salat al-Fajr, which is said after dawn and before sunrise. Another Muslim man joined us within a few minutes. Our lonesome concourse immediately felt charged with positive energy. Softly, I was doing my Ujjayi breathing, and imagining what the similarly soft-voiced recitation of the Quran next to me was all about. My mind wandered to how these practices we were doing together serve us, not only during this hour, but also to guide our daily lives; no doubt these practices sustained all three of us every day. My mind wandered further to the hope that our practices will help us find commonality, not only in a darkened unused concourse, but all over the world, among all the people who perceive themselves to have so many differences. As the sun illuminated the day, I looked outside: it was a blustery day; several planes were parked. This had been one of my more satisfying yoga classes! 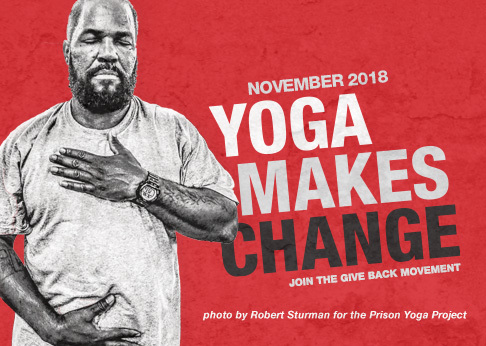 Stay connected with Give Back Yoga as we share the gift of yoga, one person at a time. Follow us on Facebook, Twitter and Google+, and subscribe to our monthly newsletter.